Currently on Back-Order till Mid-June 2016. 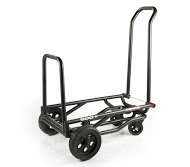 The Krane AMG 500 by Krane Carts is quickly becoming known as one of the most popular musician hand trucks and DJ Carts. It was originally designed for creative professionals, including musicians, DJs, photographers, cinematographer, film makers, studio engineers, audio/video techs, stage crews and more. However many people in all kinds of diverse applications have come to recognize the benefits of this 3 position cart. Available accessories include a solid carpeted deck, a stage wedge that transforms the AMG 500 into a tilted monitor stand, allowing you to leave your speaker rig on-board, and bungee cords. Transforms from its compact and portable storage mode to 3 practical positions, each boasting solid, reliable performance. Designed to accommodate those who prefer to keep their gear in an upright position (e.g. shock-sensitive gear, drum cases, etc. ), the platform mode offers a versatile alternative to hauling your equipment, while maintaining the same short wheelbase for tight turns and pivots. The entire frame of the V-CART SOLO™ is built using 1" steel tubing for uncompromised strength, and unlike other rickety carts out there with telescoping platforms, it minimizes weak points and cumbersome operation found on carts having excessive moving parts. A must-have for lighter loads, climbing steps, or needing to push the V-CART SOLO™ forward, this indispensable mode allows for quick trips from your car to the stage without skipping a beat! 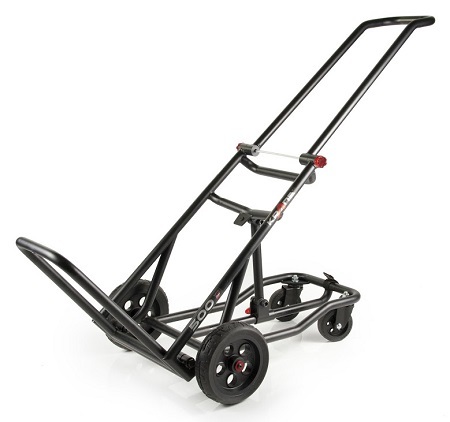 33 years in a job that demands equipment being loaded, unloaded on a daily basis and I just now found the best handtruck on the market. Four tires to balance and move the load without pushing and pulling on your already tired joints. The most awkward load moves easily and safely. Thanks Hal for all your help. This cart is perfect for my needs. I work in an IT dept for a manufacturing co. and we deploy multiple machines per week. I've been impressed by the versatility and stability of this cart. I'm seriously contemplating purchasing one for my personal use.